Humanity's quest to colonize Mars could receive a big boost from some tiny worms, a new study suggests. Scientists tracked the development and reproduction of the microscopic roundworm Caenorhabditis elegans through 12 generations on the International Space Station. Studying these space-hardened worms could help humans deal with the rigors and risks of the long trip to Mars, researchers said. "We have been able to show that worms can grow and reproduce in space for long enough to reach another planet, and that we can remotely monitor their health," study lead author Nathaniel Szewczyk, of the University of Nottingham in the United Kingdom, said in a statement. "As a result, C. elegans is a cost-effective option for discovering and studying the biological effects of deep space missions," Szewczyk added. "Ultimately, we are now in a position to be able to remotely grow and study an animal on another planet." The roundworm has about 20,000 protein-coding genes — nearly as many as humans, who have about 23,000. Furthermore, there is a lot of overlap between our genome and theirs, with many genes performing roughly the same functions in both species. Szewczyk and his colleagues wanted to see if C. elegans would make a good study subject in orbit as well as on Earth. So they developed a compact automated culturing system that can be monitored remotely. Then the researchers launched 4,000 C. elegans to the space station on the space shuttle Discovery's STS-116 mission in December 2006. They were able to keep tabs on the worms for the next three months as they zipped around the Earth at 17,500 mph (28,163 kph). The tiny space travelers did encouragingly well, growing and reproducing despite the microgravity environment. The researchers concluded that studying C. elegans could shed light on some of the challenges humans will have to overcome to become a multiplanetary species. Those challenges include the muscular deterioration and radiation exposure associated with long-duration spaceflight. "While it may seem surprising, many of the biological changes that happen during spaceflight affect astronauts and worms, and in the same way," Szewczyk said. The researchers report their results Nov. 30 in the journal Interface. Since roundworms have shown bravery in low-Earth orbit, it may be time to send them farther afield to aid human exploration efforts, researchers said. 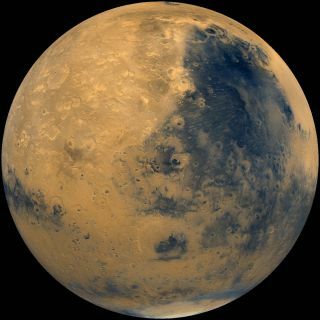 Launching C. elegans to Mars, for example, would allow scientists to see just how dangerous the high radiation levels found in deep space — and on the Red Planet's surface — are to animal life. "Worms allow us to detect changes in growth, development, reproduction and behavior in response to environmental conditions such as toxins or in response to deep space missions," Szewczyk said. "Given the high failure rate of Mars missions, use of worms allows us to safely and relatively cheaply test spacecraft systems prior to manned missions."